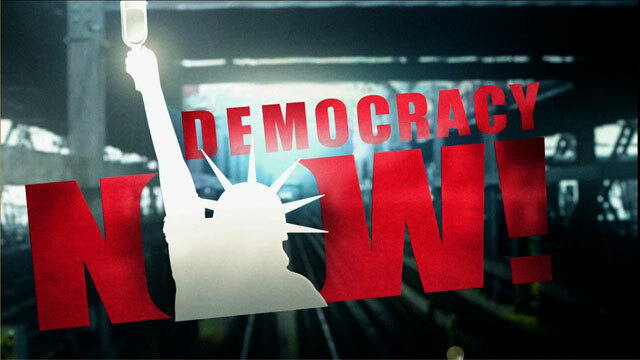 Occupy Wall Street Protest Enters Second Week; 80 Arrested at Peaceful March | Democracy Now! pepper-sprayed in Occupy Wall Street protest. arrested Occupy Wall Street protester. AMY GOODMAN: Yes, it’s day 10 of the Occupy Wall Street campaign. On Saturday, more than 80 protesters were arrested as hundreds took part in yet another march to Wall Street. The New York Police Department used nets and physical force to break up the crowds. Videos uploaded to YouTube show officers pepper-spraying protesters in the face from close range, punching demonstrators and dragging people through the street. Since Saturday, September 17th, thousands, inspired by popular uprisings from Spain to the Arab Spring, gathered near Wall Street to decry corporate greed. On Sunday, protesters issued a communiqué calling for the resignation of the New York police commissioner, Raymond Kelly, and a dialogue with Mayor Michael Bloomberg. Ryan Devereaux and Jon Gerberg of Democracy Now! were in the streets talking to people about what took place. NATHAN SCHNEIDER: There were some arrests down in the Wall Street area, including someone from the media team, around Fifth Avenue and 12th Street. There was a mass arrest. As many as a hundred, perhaps around a hundred, were taken in, in police vans, in city buses. And then those who remained came down. There were reports of pepper spray being used, people being dragged around on the ground by their hair. The witness reports are still coming in. YELL: My name is Yell. This one police officer had whipped out his mace and sprayed it about a foot away from me and around my area, where there were other people. The mace at that point was so close to me that it was dripping down my face, down my chest, all over me. It was ridiculous. I was about maybe 45 to an hour—I was blind for about 45 minutes to an hour. I’m not going anywhere. I’m not going anywhere. They need to do a lot more to move me. We sat inside one of these police vans, 16 of us, for two-and-a-half hours with the doors closed. We couldn’t breath in there, and there was a man in there who needed medical attention. He had a big, huge laceration on his eyebrow. There were a couple other brothers who had scrapes on their leg, big cuts into their leg. And everybody was just laughing at us. The cops kept circling around. We asked for water. No water. We had our phones. We were sending pictures; we were making phone calls. We even called 911, and 911 said, “You’re with the cops, they’re there to protect you,” and she hung up the phone on me. There’s a lot of—there’s a lot of causes out here, but I think the main thing that we’re looking for is that we’re human beings, and human beings should come before money. Human beings should come before profit. There’s a lot of greed out here, and a lot of people don’t have things, and there’s a few small people who do have it, and they’re keeping it from us. And they’ve got the cops out here to protect them, and they should be out here protecting us, you know? That’s why we’re out here, because there’s injustice going on. And everybody wants to know, what’s our cause, what’s our cause? Listen, this is not just a protest. This is a struggle. It’s a fight. It’s a war going on. And we’re fighting a peaceful war. WYLIE STECKLOW: I believe, as a constitutional lawyer, that the actual act of being here, of doing two general assemblies a day, of doing two marches a day, and of trying to have this peaceful assembly, putting out cardboard signs that other individuals will come around and see, this whole act is expressive speech. This is the First Amendment. It’s a living, breathing moment of the First Amendment in action and something that I don’t recall really seeing quite like this before. NATHAN SCHNEIDER: What they’re doing here is the assembly. The core demand, I think, right now, seems to be the right to organize, to have a political conversation in a public space, to show Wall Street, so to speak, what democracy looks like. AMY GOODMAN That was Nathan Schneider, editor of the website wagingnonviolence.org. He talked about the protest over the last 10 days. NATHAN SCHNEIDER: This protest began on Saturday with a rally down near Bowling Green and then a march up to a surprise location, which turned out to be Liberty Plaza. Since then, people began spending the night, that first night. Every day since, there have been interactions with the police, generally including arrests. There’s been a lot of frustration about media coverage. But what matters more is that this group is learning the skills that are necessary in order to build that kind of coverage and build that kind of presence in the media. HENRY JAMES FERRY: My name is Henry James Ferry. The media center is a—it’s a varied group. It’s made up of people who are live streaming through a handle of “Global Revolution.” It’s made up of people like me, who are tweeting from “The Other 99.” That’s my handle, “The Other 99.” I also have a Facebook account that’s putting up the list of our media events at “We are the Other 99.” And we want to be a primary source of information. This is day eight of the occupation. We want to create a narrative that the media can use to tell this story. Right now, this is a very messy, disconjointed story, and I don’t think the media knows how to cover it. We’re trying to create that narrative so that they have primary information, sourced with pictures, with video, with sources that they can trust, so they can go out and tell the message to the whole country and the whole world. AMY GOODMAN For more on Occupy Wall Street, you can go to our website at democracynow.org. And organizers in Los Angeles have now just announced an Occupy Los Angeles campaign.